Nestlé has launched KitKat Ruby to chocolate lovers in Europe after a successful debut in Japan and Korea earlier this year. In January, Nestlé’s KitKat became the world’s first brand to adopt Barry Callebaut Ruby chocolate innovation – the fourth category of chocolate after milk, dark and white. 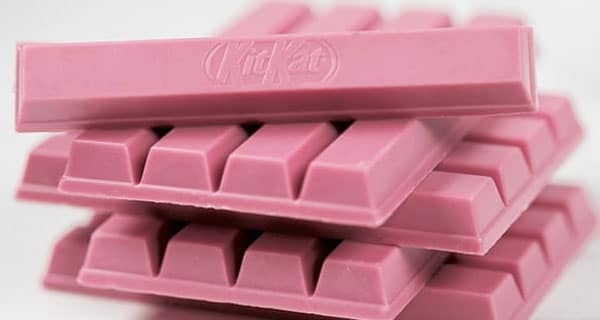 Japanese KitKat was the first consumer brand to launch a Ruby chocolate version named KitKat Chocolatory Sublime Ruby – and now the iconic KitKat brand has been unveiled to European consumers. KitKat Ruby offers consumers a new way of savouring chocolate, according to Nestlé. The crispy four-finger wafer bar is coated with Ruby chocolate, derived from Ruby cocoa beans, which has an intense berry-fruitiness taste without the addition of any flavour or colour. Leveraging its speed and agility in innovation, Nestlé is the first to produce and launch this fourth type of chocolate to consumers worldwide through its global brand Nestlé KitKat. “Our teams globally took just four months to develop the first product after Ruby chocolate was revealed. We are very pleased with the speed and innovation KitKat Ruby brings and is now excited to introduce it to more consumers in Europe,” said Alexander von Maillot, Global Head of Confectionery. He added that Nestlé is continuing to grow its leading international confectionery brand around the world and the launch of KitKat Ruby is further proof of that. KitKat Ruby is manufactured in Hamburg, Germany, using UTZ-certified cocoa beans. KitKat Ruby will be available in major retailers across Europe, starting with an exclusive deal with UK retailer Tesco (at an RRP of 85p – but prices may be different in store because retailers can set their own prices), to meet the growing demands of consumers who enjoy experimenting with new trends. Swiss chocolatier Barry Callebaut spent over a decade developing this innovative flavour. “I am very pleased to see the result of our partnership with Nestlé, the iconic four-finger KitKat made with our Ruby chocolate. Consumers across the world will be intrigued by the unique taste of this crispy delight,” said Pablo Perversi, Chief Innovation, Quality and Sustainability Officer at Barry Callebaut. The March 2018 issue of The World of Food Ingredients features a detailed interview with Pablo Perversi about this innovation.